Foam Sponge: These kitchen scrubbers are widely used to clean kitchen utensils, household accessories, tiles, wash basins and various other allied accessories. Steel Juna: Cleanup presents box of 12 stainless steel scrub pads for cleaning Material used in the scrubber is high quality rust free stainless steel. 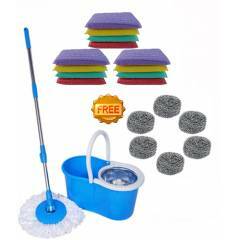 Navisha Assorted Steel Mop with Free Foam Scrub Pad & Steel Juna, MOP0584 is a premium quality Wet Mops from Navisha. Moglix is a well-known ecommerce platform for qualitative range of Wet Mops. All Navisha Assorted Steel Mop with Free Foam Scrub Pad & Steel Juna, MOP0584 are manufactured by using quality assured material and advanced techniques, which make them up to the standard in this highly challenging field. The materials utilized to manufacture Navisha Assorted Steel Mop with Free Foam Scrub Pad & Steel Juna, MOP0584, are sourced from the most reliable and official Wet Mops vendors, chosen after performing detailed market surveys. Thus, Navisha products are widely acknowledged in the market for their high quality. We are dedicatedly involved in providing an excellent quality array of Navisha Wet Mops.